Our mission is to provide customers with quality products and services that meet or exceed their expectations. 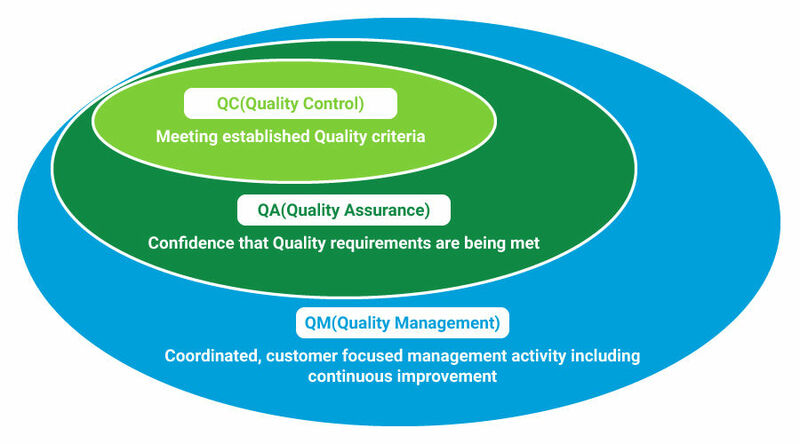 Quality Management (QM) is the management of all activities required to maintain and continuously improve this level of excellence and includes quality planning, assurance and control. The continuous improvement of quality is based on a Quality Management System (QMS) that aims for total customer satisfaction where emphasis is given to all aspects of quality to handover a product to the customer that satisfies all requirements. The first stage of customer satisfaction begins with our daily works. Normal business routine provides the most suitable platform for employees and organizations within Chiyoda (customers in the Company) to accomplish their duties and this practice will lead to customer satisfaction. Continuous improvement stems from understanding a process that requires improvement and includes collecting and analyzing information such as customer satisfaction reports and complaints (feedback). The conceptual diagram for optimization of roles to deliver a product or service which focuses on meeting or exceeding customer expectations is shown below. QM commences with “customer focus”, provides confidence of meeting or exceeding customer expectations (Quality Assurance) and includes procedures to ensure established quality criteria are met (Quality Control). Chiyoda received ISO9001:1994 (International Standard of the Quality Management) certification in the field of project management in 1994 which is maintained for ISO9001:2015. Quality management, aimed at meeting or improving upon customer requirements is included in the Occupational, Health & Safety, Quality and Environment (SQE) basic policy, and is united with other company management plans. We register 16 auditors, certified by IRCA, as of April 2018 achieved international auditor registration. The auditors conduct QM assistance for mainly large-scale overseas projects as well as domestic projects and routine works. Evaluation of an "Administration Plan" (Quality Targets) in all business divisions to conform to Mid-Term Management Plans by the end of the fiscal year, and strategies for improvement to meet unachieved targets. Establishment of Occupational Health, Quality, Environment and Information Security Basic Policy, development of quality targets, internal audits, quality through performance data analysis, corrective actions, preventive actions, management reviews, monitoring customer satisfaction, product requirements and continuously improving the effectiveness of QMS. Developing internal audits and checking maintenance and management of QMS to uncover problems and implement solutions. Utilize internal auditors to penetrate the consciousness of QMS into every corner of the organization for continuous improvement in customer satisfaction.